An international forum today (Wednesday 29th October) heard that interface communities are taking brave steps to address peace walls, but the resources available to support progress are not enough to meet the appetite for change. As part of the Forum for Cities in Transition, more than 80 people from 15 divided cities across the Middle East, Africa and Europe visited local groups involved in the International Fund for Ireland¹s Peace Walls Programme (PWP). Launched in 2012, the PWP seeks to create the conditions needed to begin the removal of the interface barriers and has provided a range of confidence and relationship building initiatives to assist residents to arrive at a position where they feel it is safe and appropriate to consider the removal of Peace Walls in their area. The PWP delivery model has generated considerable momentum for positive physical transformation and received widespread acclaim from community groups, government departments and statutory agencies. “Supporting interface communities to deliver meaningful and sustainable change, both physical and attitudinal, is a key part of our work. We are always keen to promote and share our work with other parts of the world emerging from conflict. Peace walls are among the most visible remaining symbols of community division in Northern Ireland, but there are real concerns that early removal could negatively impact on the safety of residents and potentially de-stabilise the Peace Process. 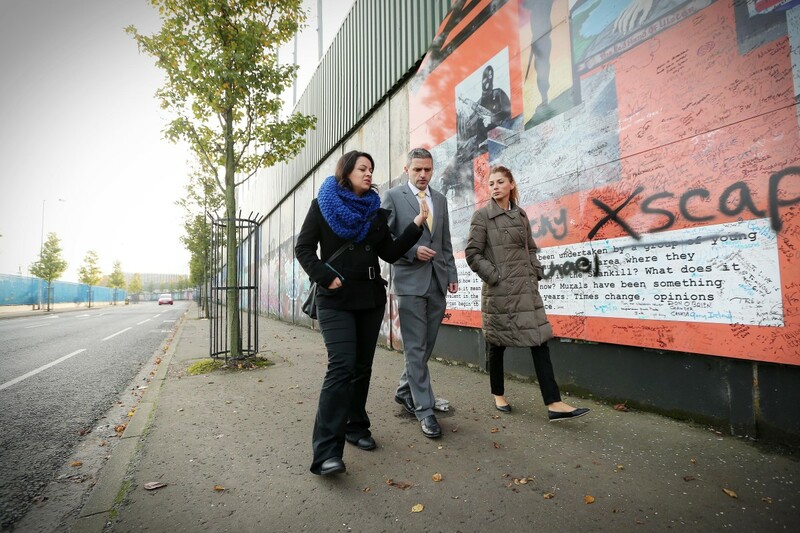 There are approximately 100 Peace Walls in Belfast with a smaller number in Derry/Londonderry and Portadown. Approximately 30 Peace Walls have been erected since the signing of the Good Friday Agreement in 1998. The Forum for Cities in Transition is a four-day gathering aimed at debating and learning from challenges and successes of peacebuilding. Forums for Cities in Transition is funded by the International Fund for Ireland, Irish Department of Foreign Affairs and Trade (Irish Aid and the Reconciliation Fund), Belfast City Council, Northern Ireland Housing Executive, Ireland Funds and the Community Relations Council. Rotary District 7950 was represented at the Forum on October 25 as an observer. In a presentation to all the delegates it was pointed out that Rotary Clubs within the cities being part of the Forum for Cities in Transition could be a substantial resource to the Forum and its delegates, helping with the implementation of some of the specific projects agreed upon among the delegates to improve lives within their communities. Rotary Clubs, both within their communities and beyond through cooperation with each other, work for peace and understanding, conflict resolution or transformation, disease prevention and treatment, clean water & sanitation, maternal & child health, basic education & literacy, as well as economic &community development.